We are now in possession of the brand new RECEIVE 2 and TRANSMIT 2 high end audio interfacing modules from Joranalogue! These are both dual channel/ stereo designs, with all the features you could wish for, including: professional grade sockets; pristine headphone preamp; LED metering; and high quality components used throughout both designs. Perfect for interfacing your modular system with the outside world in a reliable and professional manner. 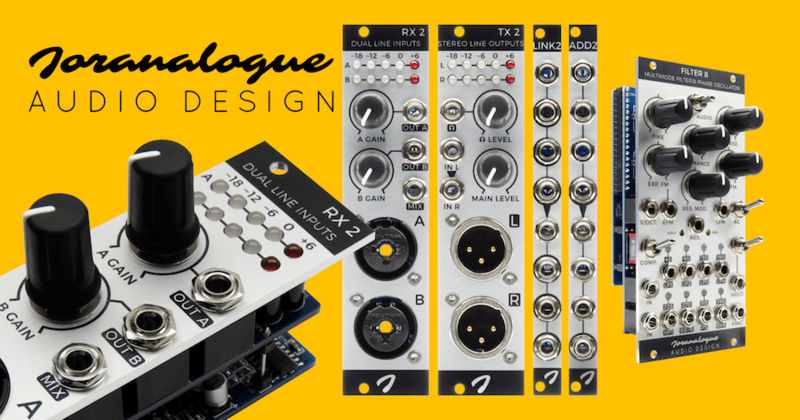 Previous post: Alright Devices CHRONOBLOB 2 dual digital delay back in stock! Next post: Preorders open: 4ms SPHERICAL WAVETABLE NAVIGATOR – 6-channel wavetable synthesizer, shipping early May!